A check of nine local badger setts today found plenty of evidence of badger activity. This was particularly welcome in the case of the first two setts visited, as they have been subjected to blocking up for several years. With certain exceptions, blocking or otherwise obstructing any entrance to a badger sett is an offence under the Protection of Badgers Act 1992. Originally the Act included an exception which permitted the obstruction of badger sett entrances for the purpose of fox hunting, providing that this was done in accordance with the conditions laid down in the Act. This exception was however repealed in England and Wales by Schedule 3 of the Hunting Act 2004. Although the setts in question have been repeatedly blocked up, the resident badgers have been as persistent as the people interfering with their homes. The photo above shows one of the setts’ entrances with a large amount of freshly excavated sandy soil outside, pockmarked with badger paw prints. This was almost certainly done last night. The photo below provides a close-up view of some of the badger tracks in the sand. Another of the setts checked today was first watched by Steve Jackson back in 1978. Steve arranged badger watching evenings at this sett for over 2,000 people during the years following his initial observations of badgers there, until the brocks abandoned their home a few years ago to take up residence in another of their setts nearby. Since then the badgers have made return visits to their original home, sometimes having cubs in their traditional nursery chambers before moving back to their other sett for the Summer. Today, over a third of a century on from Steve’s first visit, the sett is still active, with large piles of recently excavated sandy soil outside two of the entrance holes. A close-up view of the furrow leading from one of the holes reveals the marks made by a badger’s claws as a load of soil was dragged out onto the spoil heap. This follows the abandonment, announced last week, of badger killing in Wales in favour of a programme of vaccination. The Bow Group’s document  rightly recalls that killing badgers has been proven to have made bTB worse and that the focus should be on vaccination instead. The group, which says it exists to develop policy, publish research and stimulate debate within the Conservative Party, has published contributions from some of Britain’s leading bTB scientists and a foreword by former Queen guitarist, animal rights campaigner and astrophysicist Dr Brian May. Peter Kendall, President of the National Farmers’ Union responded: “There is nothing new in this report; it repeats the same arguments on science, costs and the effectiveness of a badger cull in the fight against TB as we’ve heard before.” In a statement to the Farmers’ Guardian he added that it was “hugely disappointing” that the group would base its reasoning on a statement that culling was unpopular. The Bow Group calls its paper “Common Sense and Bovine TB” and has included the work of leading bTB scientists who have been working on the disease with massive resources and knowledge for decades. Mr Williams said: “Despite this the NFU and its president still sweep aside the findings of eminent scientists.” The £50 million Randomised Badger Culling Trial (RBCT) concluded that “badger culling can make no meaningful contribution to cattle TB control in Britain. Indeed, some policies under consideration are likely to make matters worse rather than better” . In its executive summary the Bow Group refers to 15 per cent of badgers carrying bovine TB, but later explains that this was the average prevalence among a small number of road kills . The RBCT showed prevalence to be as low as 11.3 per cent in the high incidence areas studied . The Bow Group is the oldest and one of Britain’s most influential centre-right think-tanks. It develops policy, publishes research and stimulates debate within the Conservative Party. It has no corporate view, but represents all strands of conservative opinion. See: Bow Group urges Government to scrap badger cull plans. Common Sense and Bovine TB. Final Report of the Independent Scientific Group on Cattle TB. Page 5: First, while badgers are clearly a source of cattle TB, careful evaluation of our own and others’ data indicates that badger culling can make no meaningful contribution to cattle TB control in Britain. Indeed, some policies under consideration are likely to make matters worse rather than better. Second, weaknesses in cattle testing regimes mean that cattle themselves contribute significantly to the persistence and spread of disease in all areas where TB occurs, and in some parts of Britain are likely to be the main source of infection. Scientific findings indicate that the rising incidence of disease can be reversed, and geographical spread contained, by the rigid application of cattle-based control measures alone. Final Report of the Independent Scientific Group on Cattle TB. Table 4.15. The Badger Trust welcomes the Welsh Government’s science-based decision to vaccinate badgers against bovine tuberculosis (bTB). This is the only sensible, practical way forward; culling would have made matters worse at great cost to the Welsh taxpayer. A culling proposal by the last Welsh Assembly Government (WAG) was quashed in 2010 following judicial review proceedings brought by Badger Trust. WAG then produced in 2011 a new, even more risky culling proposal including free-shooting, which Badger Trust challenged alongside four co-claimants in the affected area. The Welsh Government’s revised plan was paused after last year’s election when the new Government agreed to conduct a comprehensive review of the science. The Badger Trust is pleased that this Government is saving Welsh taxpayers, rural communities, and badgers from a cull. Following a thorough review of the science, the Minister has today concluded that a cull of badgers is not necessary and would not bring about any substantial reduction in the incidence of bovine TB. Vaccination represents a safe and satisfactory alternative. The Welsh Government has made the right decision. The Badger Trust now calls on Caroline Spelman to reconsider her costly, counterproductive cull plans for England. The Trust has commenced judicial review proceedings to prevent the proposed counterproductive and unscientific slaughter in England of tens of thousands of disease-free badgers – killing that could make matters worse and prompt the spread of disease at great cost to farmers, badgers and rural communities. The Trust is already working alongside the National Farmers’ Union towards taking this modern vaccination technology into the field following successful DEFRA and FERA vaccination trial results published in 2010 . Test results show a 74% reduction in the proportion of wild badgers giving positive results to TB tests. Other vaccination programmes have also yielded positive results . The Badger Trust would welcome the opportunity to work with the Welsh Government on their vaccination programme and could share the knowledge gained from our own badger vaccination work with farmers. David Williams, chairman of the Badger Trust, said: “Cattle control measures are sufficient in themselves to eradicate this disease and were highly successful up to 1990 without killing badgers. But, in the meantime, vaccination offers quicker and more permanent benefits to cattle farmers than shooting badgers for a benefit of only 12 to 16 per cent at best over nine years at great cost to the tax payer. Periodic vaccination prevents reinfection, mostly from cattle, and avoids badger populations being disturbed, a feature of badger ecology which would risk spreading bTB further. Given that culling badgers can provide no meaningful contribution to the eradication of bTB we welcome the Welsh Government’s sensible, science-led approach” . Bacillus Calmette-Guérin vaccination reduces the severity and progression of tuberculosis in badgers. (See also Culling is no better than vaccination for bovine TB control). Mark Harold, director for the National Trust’s South West region, says the programme on the Killerton estate near Exeter (6,400 acres, 3 miles square) would show whether vaccination could be deployed over a large area, and so pave the way for its more widespread use as an effective alternative to culling. Independent Scientific Group Final Report: “First, while badgers are clearly a source of cattle TB, careful evaluation of our own and others’ data indicates that badger culling can make no meaningful contribution to cattle TB control in Britain. Indeed, some policies under consideration are likely to make matters worse rather than better. Second, weaknesses in cattle testing regimes mean that cattle themselves contribute significantly to the persistence and spread of disease in all areas where TB occurs, and in some parts of Britain are likely to be the main source of infection. Scientific findings indicate that the rising incidence of disease can be reversed, and geographical spread contained, by the rigid application of cattle-based control measures alone. In 2006 we rescued an orphaned badger cub (who we later named Ewan) from a roadside sett in West Northants. Last weekend a check of that sett revealed that the badgers living there have been busy expanding their underground home. The photo above shows a groove or furrow formed by a badger as it repeatedly reversed out of the sett, using its long-clawed forepaws to drag load after load of soil and stones out of the sett entrance and up onto the top of the spoil heap outside. This may be a sign that there are cubs at the sett again. We hope that they won’t need rescuing! On Monday (27 Feb 2012) the Badger Trust lodged a claim in the High Court to seek a Judicial Review of DEFRA’s decision of 14th December 2011 to kill badgers in England. The Trust continues to do all it can to prevent the proposed ‘DIY’ farmer-led cull, which will not benefit badgers, cattle, farmers, rural communities or the tax-payer. This action follows extensive legal and scientific advice as well as correspondence and meetings with DEFRA to clarify its position on the many issues of concern to the Trust. 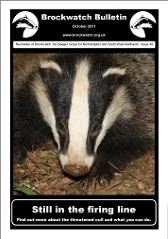 The Badger Trust and a majority of the public consider that the cull poses serious risks to cattle and badgers. The methodology for evaluating any results from the cull is also defective. Before now it was unclear what DEFRA had actually decided, and what remained to be decided following the ‘pilot’ culls planned for late 2012 in Gloucestershire and Somerset. In light of DEFRA’s various responses, the Trust has now concluded that the decision is unlawful and should be quashed. 1) The Secretary of State has authorised Natural England to issue licences to reduce the rate of new incidences of bovine TB (although she expects a mere 12-16% reduction in bTB after 9 years at a huge net cost to the farmer). However, ‘reducing incidence’ is not the purpose for which the legal power was granted. The culls proposed will not meet the strict legal test of “preventing the spread of disease” in the areas being licensed, and may in fact amount to a recipe for spreading the disease. DEFRA’s own evidence confirms that the proposed cull would in fact prompt the spread of disease in and around the cull zones. Badger Trust considers that this is in direct opposition to the aims in the strict test set down in section 10(2)(a) of the Protection of Badgers Act 1992. 2) The cost impact assessment underpinning DEFRA’s decision is flawed, as its cost assumptions are based on the farmer free-shooting option (this is estimated to be approximately ten times cheaper than cage-trapping badgers before killing them). However, after the first year of piloting the cull plans, the free-shooting method may be ruled out for being inhumane, ineffective or unsafe to the public. In that case, farmers will find themselves legally obliged to continue the cull on the much more costly “trap and shoot” basis until the end of the 4-year licence. This is a significant cost risk for farmers, yet it is not properly reflected in the cost impact assessment which underpinned DEFRA’s decision. The Secretary of State did not ask herself the right questions so as to obtain crucial information on costs. Badger Trust considers that this renders the decision entirely unlawful. Given the poor cost-benefit prognosis for the cull, the Trust also hopes that Parliament and the farming community will now carefully reconsider DEFRA’s ‘Big Society’ DIY cull plans. 3) Guidance which DEFRA issued to Natural England is invalid. Under section 15(2) of the Natural Environment and Rural Communities Act 2006 the Secretary of State may issue guidance to Natural England as to how Natural England should exercise its functions. However, killing badgers is not one of Natural England’s original functions, which are mainly focussed on maintaining biodiversity. Even though DEFRA is making Natural England responsible for the licensing arrangements, under section 10(2)(a) of the Protection of Badgers Act 1992, culling badgers ‘for the prevention of spread of disease’ remains the Secretary of State’s own function. Thus, she had no legal power to issue section 15 guidance to Natural England in these circumstances. Culling badgers as proposed (whether by free-shooting or trapping and shooting) can make no meaningful contribution to the eradication of bTB and risks making matters worse. Stricter cattle measures – as 10 years of taxpayer-funded independent research have concluded – will beat the disease. The badger appears to be a scapegoat for an industry that underrates the risk of cattle-to-cattle transmission, and one which has reportedly experienced a significant number of incidents of poor animal husbandry, fraud and flouting of cattle management regulations.